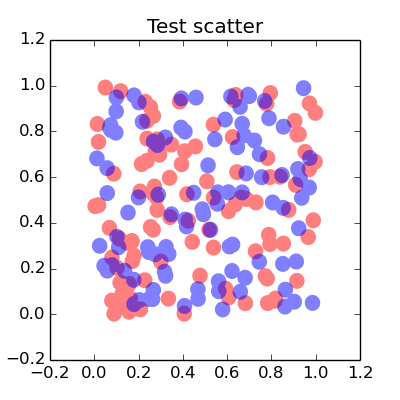 I'm making some scatterplots using Matplotlib (python 3.4.0, matplotlib 1.4.3, running on Linux Mint 17). It's easy enough to set alpha transparency for each point individually; is there any way to set them as a group, so that two overlapping points from the same group don't change the color? I can workaround by saving as SVG and manually grouping then in Inkscape, then setting transparency, but I'd really prefer something I can code. Any suggestions? This is a terrible, terrible hack, but it works. 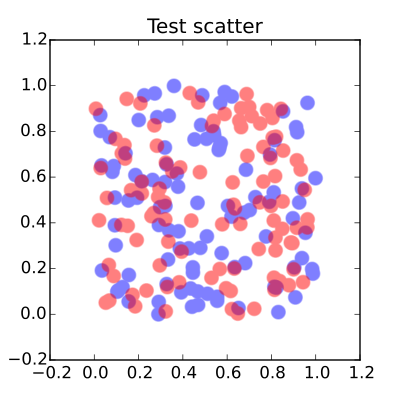 You see while Matplotlib plots data points as separate objects that can overlap, it plots the line between them as a single object - even if that line is broken into several pieces by NaNs in the data. And each color will overlap with the other color but not with itself. One caveat is that you have to be careful with the spacing between the two points you use to make each circle. 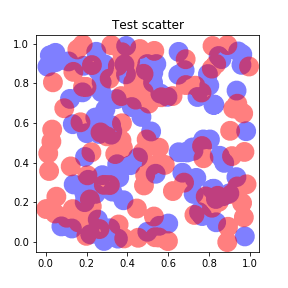 If they're two far apart then the separation will be visible on your plot, but if they're too close together, matplotlib doesn't plot the line at all. That means that the separation needs to be chosen based on the range of your data, and if you plan to make an interactive plot then there's a risk of all the data points suddenly vanishing if you zoom out too much, and stretching if you zoom in too much. As you can see, I found 1e-5 to be a good separation for data with a range of [0,1]. Not the answer you're looking for? 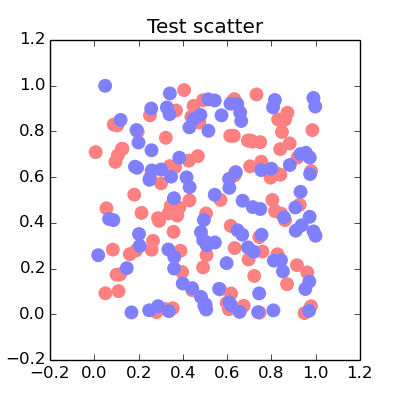 Browse other questions tagged python matplotlib transparency scatter-plot or ask your own question.